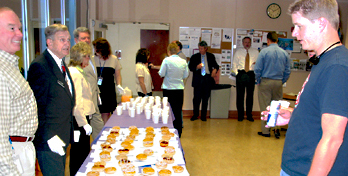 Members of ITD's Executive Team and board members Monte McClure and Jack Combo handed out mid-morning treats to Headquarters employees Thursday as part of ITD's Employee Appreciation Week. Activities included daily prize drawings, Tuesday massages, and guessing the number of peanuts in a jar. In response to an internal review of the Division of Highway’s administrative functions, ITD has embarked on a comprehensive study of the working relationships between Headquarters and ITD’s six districts. The study will identify parts of the relational processes that work well and recommend changes where necessary to increase efficiency. Alan Frew, who is less than a month away from celebrating his 21st anniversary with the transportation department, will serve as acting administrator of the Division of Motor Vehicles. He assumes, on a interim basis, the position vacated by Pamela Lowe who resigned effective April 28 to join her husband at his new job location in Italy. A self-powered crane took an unexpected bath in Benewah Lake recently when the trestle on which it was traveling collapsed. Two fishermen were perched on a wooden railroad trestle that crossed a small inlet on the lake near St. Maries. They heard a whistle and promptly heeded the warning to clear the track, heading toward the nearest wooden platform. When they looked back, the crane had disappeared. New recommendations from the U.S. Centers for Disease Control and Prevention, and the American College of Sports Medicine, state that 30 minutes of moderate activity on most days is enough to reap the benefits of exercise. This is great news. A possible attempt to fraudulently obtain personal information related to police and medical assistance has come to the attention of Oregon State Police, Legacy Emanuel Hospital and Health Center and Life Flight Network. No leads are available to determine who may be involved in this activity and no information has been received indicating similar calls have been made in Oregon, but the public should be aware of the possibility of such calls. As part of the "Celebrate the Interstate 50th Anniversary campaign", the American Association of State Highway and Transportation Officials (AASHTO) will sponsor National History Day 2006-2007. The year-long national educational event reaches more than 700,000 students and 40,000 educators in grades 6 through 12 in 47 states.